Thanks for asking. I'm still working on it. I ordered the parts last weekend and received them yesterday. I knew the middle tube on the AOS was detached at the crankcase vent valve in front of cylinder 4. So before I started the whole AOS removal, I decided to reattach this hose. I got my hands in there from below the car. I lined the "quick connect" vacuum line up with the fitting on the valve. I pressed and pressed the hose. I could never get it to go on. I examined a normal fitting and the hose off the car on the new AOS and J tube. It looked like what I was doing should work. But I can never get the leverage necessary to completely get that locking ring over the fitting. The only way I can see to get the necessary leverage is to remove the air box, which looks worse to remove than the AOS. I don't know if dielectric grease or even oil would help this hose attach to the valve. But I lost a lot of skin off my knuckles last night (through nitrile gloves) squeezing my hand into that air box area just to grip a small bend of the breather hose. But I can never get the leverage necessary to completely get that locking ring over the fitting. The only way I can see to get the necessary leverage is to remove the air box, which looks worse to remove than the AOS. I don't know if dielectric grease or even oil would help this hose attach to the valve. I would recommend to lube the o-rings on the accordion tube as these are easy to damage when you are pushing trying to secure the locking ring. Also, examine closely the accordion hose as a crack can be difficult to see, yet will have a vacuum leak and make a mess if left unattended. Lucked out big time. I went through the firewall and was able to pull the breather hose a little tighter on the valve. Then from below I was able to finally push it hard enough to snap it closed. Attached is a pic of the valve and breather hose taken from the firewall side. It's a PITA to reach. But it's done and no air box removal needed. 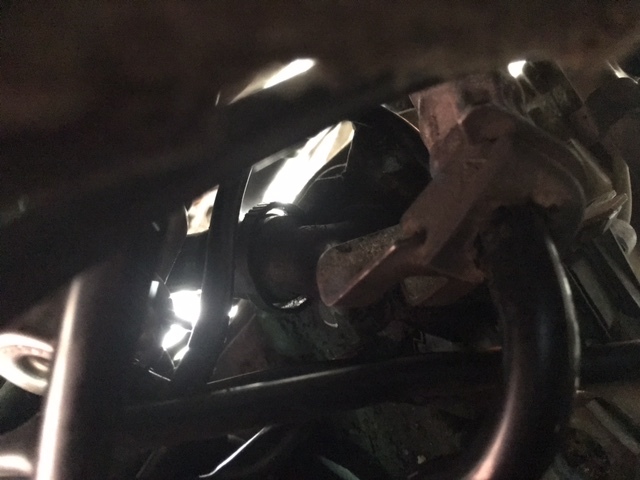 While I was under the car I undid the middle hose from the AOS, undid the bellows tube (PO had obviously replaced the AOS before - had a radiator hose clamp on it), and unbolted it from the bell housing with a 1/4 ratchet and 10 mm socket. That only took 15 minutes. So the old AOS is out. I did luck out with the radiator clamp. Now to enjoy an adult beverage and clean things up. I'll drop the new AOS in in the morning along with a j-tube and try to fire it up! Well, luck ran out. Got the AOS installed. Same symptoms persist. I can feel the crankcase getting ventilated, I removed the oil filler cap and could feel a slight vacuum. So I know I'm getting vacuum now. Here's a video of it running (if you call it that). I'm kind of running out of ideas. These are the same spark plugs that I have been using. They're getting spark but they were soaked in gasoline at one point. I may be down to injectors, but I'm having trouble believing that three are sticking on cylinders 4, 5, and 6. Last edited by tada; 04-15-2016 at 11:54 AM. Thanks for the video. This doesn't sound like rough idle, that sounds like it's running only on 3 cylinders / one bank. Can you rev it up? Or does it only run on idle like shown in the video and does it die if you press the throttle? Did you check the coolant water for oil? Any cracks in the engine housing? Do you have the possibility to do a compression test / or have you done a compression test on each cylinder? Did you check if the injectors work correctly? Have you tested the ignition coils? Are the coil packs OK or do some of them have cracks? It is only running on cylinders 1, 2, and 3. The other bank is constantly flooded. Can't rev it up. Dies if gas is given. No cracks in the housing. Coolant and oil are clean. Oil is starting to smell like gas. Have not done a compression test. I checked all injectors with a noid light. Light is pulsing on all cylinders. Coil packs have no cracks, ohmed out correctly and I have spark at each plug (grounded the case of each plug while attached to the coil pack and verified spark). So I now have spark, injector pulses, and vacuum. I guess I should run a compression test. The only thing left is to get the injectors cleaned and flow matched. Compression test is probably the way to go. Dang, I was really hoping we had you figured out with the AOS. Sounds like this thing was seriously neglected by the po. I may try some new spark plugs. I changed these when I first got the Boxster. They are really fuel and carbon fouled (per bank). No miles on them, but it may be good to eliminate variables. +1 on the compression test BEFORE you buy new plugs. Establish the unknown first then eliminate variables. Is it possible to have the wires run to the wrong coils on a Boxster? I found that on a Ford Escape V6. Seeing how that AOS was rigged, I'd be looking over *everything* that could have been touched by the PO or his 'mechanic'. Based on the AOS I'd say anything is possible. However it would take someone really skilled (sarcasm) to mess that up and it would be misfiring which by the video it isn't. Compression test would offer some clue to mechanical integrity. I don't think the coil wires will reach to different cylinders. tada - have you used a Durametric to check out possible problems? You are chasing your tail without some form of scanner to give you some clue as to what is going on. If all 3 cylinders on one bank are failing to fire (I assume the offending header pipes 4,5 & 6 are still cold even after the engine has run on cylinders 1,2 & 3), then I think you have a deeper problem than an air/fuel/spark failure. I can understand losing one cylinder due to a fault, but not three - especially all on the same bank. After a compression check (which is a must) plus a comprehensive Durametric analysis if possible, a more serious mechanical problem is in your future, like bent valves - which a compression test will show - or valve timing issues. If you do complete a compression test, just make sure you remove all plugs first, remove the fuel pump fuse & make sure the throttle body is fully open (foot hard down on the accelerator pedal). Then start on the "good" side to get 3 x comparable results before going over to the problematic side. Wow, what a struggle to find the problem. This will be interesting to find the cause. The best clue is No CEL. There are only a few component faults that cause bad running but do NOT set a CEL after the problem is detected 3 times. That may be a good basis for a google search ? I understand why you want to inspect the injectors but you my find them difficult to remove. Each injector has a tiny screen in it -they may be plugged? Tom - stupid question: is the CEL bulb working? Means - is the light of the CEL light ON if ignition is ON? I would do a compression test first, because there is a whistling noise in the video that sounds like a bypass / not closed valves. Now I can see the second bank is lower, but it should not just flood. The car has 96000 miles, had 7 owners, and they probably drove the piss out of it. I'm still suspect of the Bosch Platinum +4 spark plugs. They've been in since troubleshooting began and have been flooded several times. I have a new set of Bosch 7402s that look like OEM. I'm tempted to try them. Last edited by tada; 04-19-2016 at 04:58 PM. I don't know enough about what those numbers mean, but what's another new set of plugs cost? You may as well eliminate them if others state your compression numbers look normal. I think the numbers mean it's ok. The highest and lowest value are within 15 percent of each other. So for now, I'm going to rule out a bent valve (that would be a crap your pants moment). I have the new plugs - Bosch 7402 (FR7LDC+), copper with just two electrodes that I will install tonight. Maybe with a little luck it will fire up. The Durametric is still showing no codes being thrown. I'm not sure you're ok. Hope you are but something I've been thinking for a while on your car is this, AOS was taped up and removed for some reason. If liquid oil was dumped from AOS into the 4,5,6 bank it would bend rods, not valves. Those compression numbers are pretty low, I would think they should be closer to 145 psi. JFP would certainly have the best info here. Good Luck.